A week from today: Next CT and MRI. Also, same day, my follow-up with my neurosurgeon, Dr. K, which means I’ll get a sneak preview of the MRI results at least. For the rest, I will wait two agonizing days until I get to see Dr. P. The intervening day will be visiting day at the kids’ summer camp (a/k/a the day I paw through the lost & found to find the 800 items that have managed to go missing since they started last week). How am I at waiting these days? It doesn’t keep me up at night. Nothing keeps me up at night, unless I’ve eaten a bunch of Halloween candy because I’m partying because I am off dabrafenib for a week due to my freakishly thick footsoles and can eat candy at all hours. Yes, we still have a bunch of Halloween candy in the house. I don’t keep it from the kids, but I don’t exactly remind them it’s there, either. It’s also on a shelf about 8 feet off the ground. And so picked over at this point, there isn’t much there to excite them. Or me, really, except when I am at liberty to eat candy at 10 pm. That’s not tonight though. Tonight I’m sitting here typing this in bed while J eats his second dinner, having just come back from playing basketball and then doing an unusually long grocery shop, because the meat cooler was out of order and all meat had to be paged from the basement tonight, and they sent up the wrong thing the first time. The delights of coop shopping. Coming off of a weekend in the Eating Vortex (also known as my parents’ house), I’m redoubling my efforts to rein in my eating habits. Which makes tomorrow difficult. In a social frenzy reminiscent of my high-dose steroid days, I arranged a lot of social opportunities tomorrow: a walk in the park, lunch, coffee, and drinks in the evening. I knew I was stacking everything up but somehow it didn’t bother me. On Wednesday, I get to see a friend I haven’t seen since 1992. That will be grand. Today, though, I had a day “off.” Yes, the morning started dreadfully – the kids, who went to bed at 10 pm last night because it took us seven hours to get home from DC yesterday, barely dragged themselves out of bed, and we actually saw the bus go by before we reached our corner. Luckily, the bus was a bit early. Young A said to me before we crossed the street, “You know, Mama, it’s too bad you can’t run.” That pissed me off so much – both the implication that the lateness was my fault, and the fact that I couldn’t run – that we wound up running a full block, hand-in-hand, before lurching across another street and towards the school bus. I had been planning to walk a loop of the park after dropping them off. Instead I had to come home and recuperate for an hour from the stress of the bus dropoff. I almost packed it in and went back to bed. Now, devoid of steroids, my entire life seems like one big fight against the force of inertia. I also decided last night that I’d significantly drop my daily calorie intake this week, just to see where that gets me. That, plus the two hour eating moratorium required before dabrafenib (which I went back on yesterday) meant I fueled my park walk with a cappuccino and small banana consumed before 8:15 am. I didn’t eat again until almost 1, because I stopped at the library, and then I had a high lunch concept that took a while to realize. I thought I might go mad, but… maybe I need to remember how to experience hunger again. I’ve had success in the past with Weight Watchers, but my health situation seems too precarious to be that punitive with myself just now. I’m pretty clear on the general concepts, like STOP EATING CRAP ALL THE TIME, DRINK WATER OFTEN, and COFFEE HAS LOTS OF CALORIES, THE WAY YOU TAKE IT. So, we’ll see how things go. My biggest concern about next Monday, really, is lunch. I have two scans, the first is the CT for which you fast from midnight on. The second is the MRI, for which you don’t need to fast. I may just spend the rest of the week I need to wait considering the various logistics involved and whether there is a doughnut shop in between Scan A and Scan B (although wait – I’ll have to respect my eating moratorium due to medication, arrrgh) and maybe bring a contingency sandwich if the scheduling goes all pear-shaped. I think that logistics becomes its own coping mechanism. 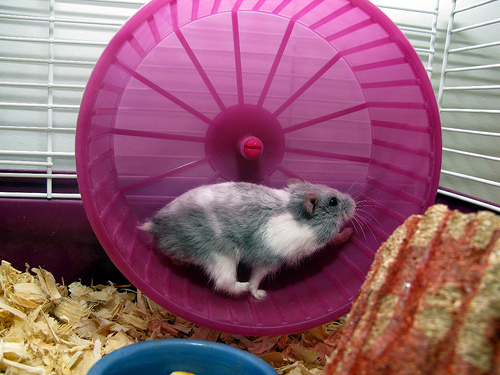 Obsessing over logistics, like where my scan day meals will come from, makes me feel more like a hamster in a wheel – purposeful, because I don’t have an outsider’s view of the purposelessness of my activity – and that way, maybe I feel less like being in the middle of a dark wood. I know you’re talking about a hard day, but your high lunch concept that took a while to realize just made my morning a whole lot brighter. Your view is the most important view. It is Zen to count every single activity purposeful. You are leading a perfect mindful life, Wow!